While I was at the Huawei Experience Store located at Shop No. 10 in Tropical Plaza Half-Way-Tree, I managed to do more than one product as I’d pointed out in Huawei P8 Lite is Black White and Gold Metallic Luxury. I’d spent some quality personal time with the Huawei TalkBand B2 and the Huawei Watch. I’m still entranced by the beauty and elegance of the Huawei Watch. I still cannot believe I got to spend so much quality time with this beautiful and elegant timepiece which I was able to touch with these hands. Being an avid wristwatch aficionado, I was truly in for a treat where Earth meets sky in the Huawei Experience Store. 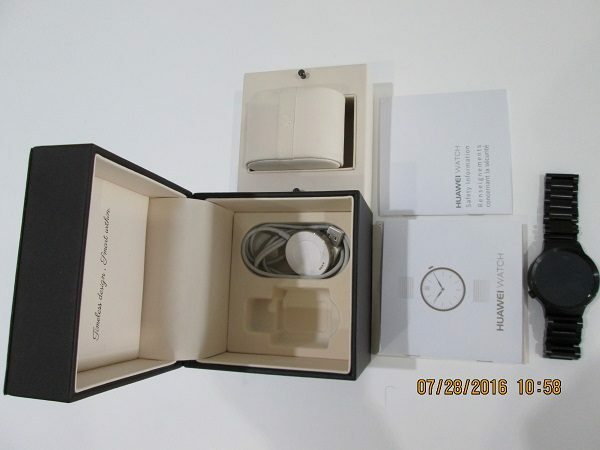 Stay tuned for the Huawei TalkBand B2 in a future article as I introduce you to the Huawei Watch. 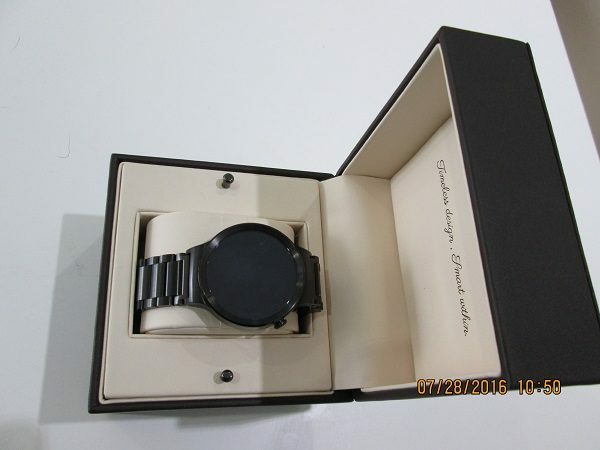 The Huawei Watch, which is an Android Wear watch by design, can be easily be mistaken for a high end wristwatch. For one, despite being a smartwatch, its cold-forged stainless steel body with its smart 42mm bezel makes it have a presence on your wrist. The unit I reviewed came in an ominous looking black box. 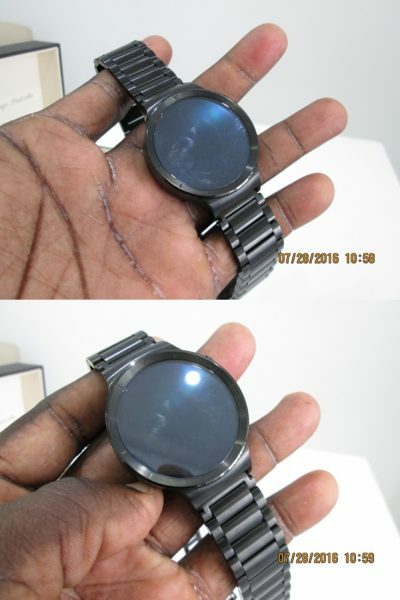 The 1.4-inch AMOLED display has a 400×400-pixel resolution (286 pixels per inch) and is protected by sapphire crystal, making it the first and one of few wristwatch to be bestowed with Sapphire glass. This mean it’s visually scratchproof, as sapphire is the next hardest mineral to diamond and look really snug in its case once opened. There is no smaller size for women, but it does support third 18mm and 21mm straps wriststraps, so it’ll look great on you little wrists. Still it comes in a rally nice looking box with a Magnetic charger and some manuals. 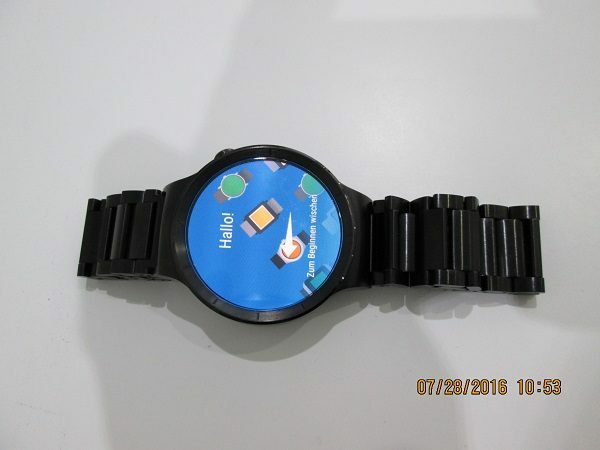 So what it like using Huawei’s answer to the Apple Watch? The AMOLED screen isn’t too bright, having only five (5) brightness levels. 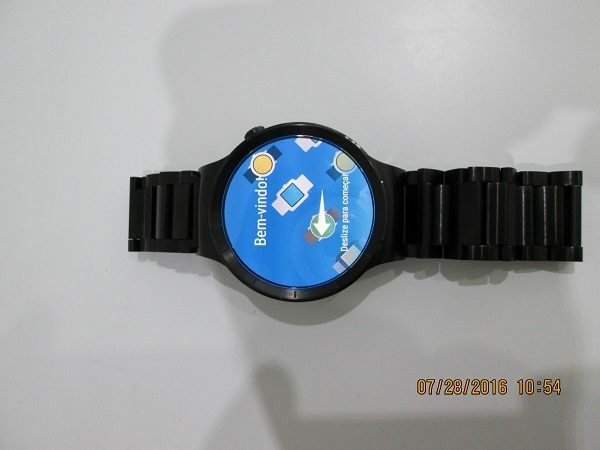 It also comes with many watch faces built in, so you can choose from class to techno looking to a more digital interface. 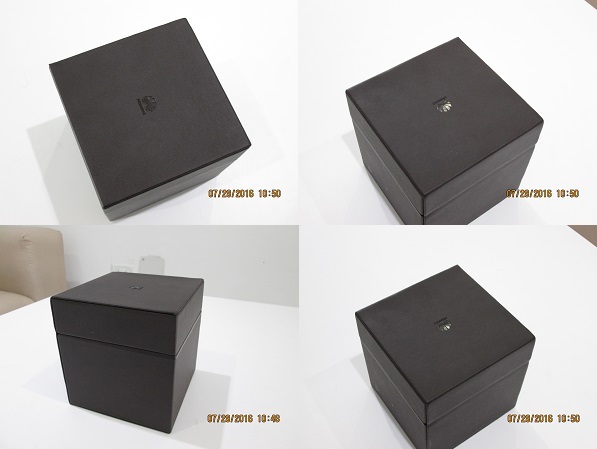 A lot of thought went into the design of the Huawei Watch as this video indicates. However, you have to adjust the brightness manually, as the watch lacks an ambient light sensor. 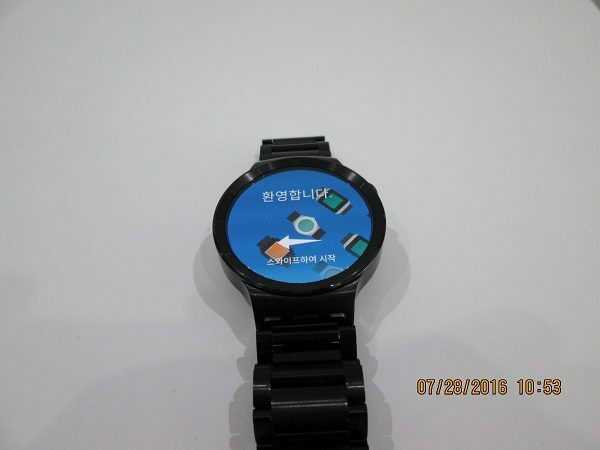 When it initially start up, it come up in Korean. You then choose the language of choice, English in my case and start browsing from there. The whole setup is powered by a 1.2GHz quad-core Snapdragon 400 processor and runs Android Wear on 512MB of RAM with 4GB of Internal memory to store you music and apps. Check out these shots showing how bright the screen can get. Yes this small little device stores music and apps and has Wi-Fi to boot. This allows you access to your notifications and messages without having to be paired with your Apple iPhone and or Google Android smartwatch all the time. Rated at IP67, it can withstand a shower but cannot take a dunking in the pool. It has a nice button shaped like a crown locate at the 2 o’clock position. Press the crown to light up the display or dim it but it does turn as I’d tried to do. Still, I’d have love it if it had NFC so it could make payment like the Apple Watch or the Samsung Gear S2. 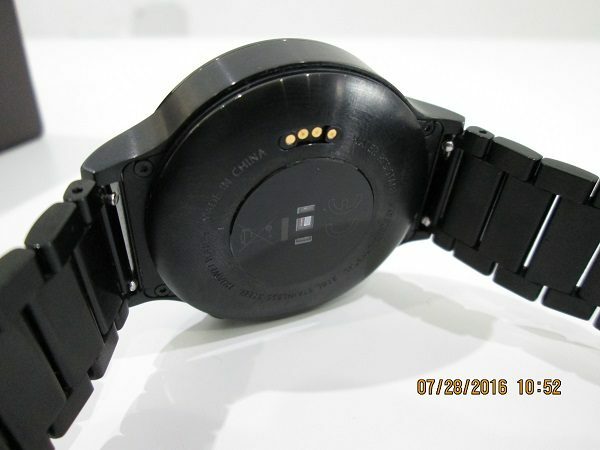 Most likely that’s coming in the second Generation Huawei Watch! That meaty little processor doesn’t support a GPS. But it does support a gyroscope, an accelerometer and a barometer, making knowing the weather while jogging around Emancipation Park quite easy! Like most Android Wear smartwatches it does double duty as a heart rate monitor, with the Green LED light on the underside to count your pulse. So you can tell if you burning carbs or just exercising too hard. 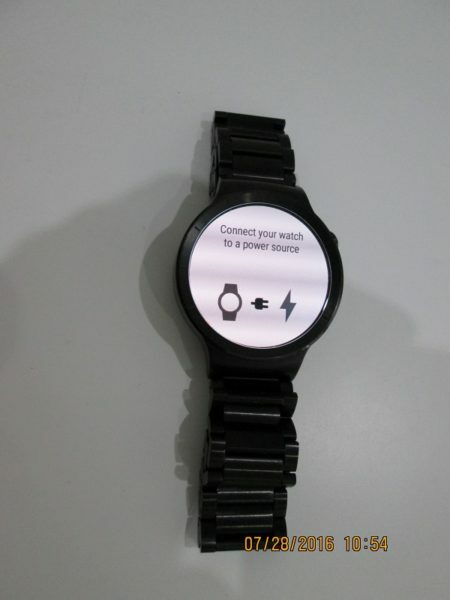 After a workout, you can recharge yourself as well as the Huawei Watch 300 mAh battery using the included magnetic dock as shown that connects to four pins on the back of the watch. The Fast charging feature means that this smartwatch can recharge to 80% in 45 minutes; Full charge in 1 and a half hours. This model I had clearly needed charging, but there was no electrical outlet nearby save for the water cooler. Not wanting to take the chance and damage this beauty, I place if back in its box. So, do you like the Huawei Watch? Then join their Huawei Jamaica Facebook Page check out the Huawei Experience Store as the Huawei Watch awaits you to make loving Huawei Smartphones Possible.